FROM THE ARCHIVES is a series of featured articles from previous Exaggerated Features. This article is a follow up from one of the seminars at the Raleigh Convention and was originally published in the 2009 Post Con Issue. For access to all the Exaggerated Features, join ISCA today. At the 2008 NCN convention in Raleigh, I had the privilege of speaking about Legal Matters for the Artist, and it became clear that the issue of the right of publicity is a hot topic for caricature artists. The right of publicity is, in general terms, a person’s exclusive right to bene t from, and the right to control the commercial use of, their name, likeness or persona. What this legal doctrine provides is that to use someone else’s name, likeness or persona, in a commercial way, you need their permission. While keeping in mind that this is a convoluted area of the law without clear guidelines, let’s see if we can break it down a little by answering some of the questions that were raised at the 2008 NCN convention. What is the law of the right of publicity? is not covered by a Federal statute. Instead, it varies from state to state. Some states have statutes, some states rely on common law (case law) and some states use both. The only certain thing is that every state’s law is different. In addition, determining which state’s (or which country’s) law should apply to your facts can be difficult in itself. There are potentially three bodies of law that can apply: where the person resides (their permanent residence, not just where they have a home), where the alleged unlawful use occurred, or where the user of the image resides. What is exempt from the right of publicity? Nearly every state recognizes that use in connection with news, public affairs, sports broadcasts, and political commentary are protected speech that trumps the right of pub- licity. However, when that use becomes com- mercial (which is subjective and determined on a case by case basis) the exemption may no longer apply. Easy examples of commercial use are advertising, sports memorabilia, and products bearing a photo image sold because of that image. Is artwork exempt from the right of publicity law? Generally, no. However, there is some case law that has carved out exceptions by nding that the artwork can be covered as First Amendment speech. Note, however, that this exception is not a hard line rule because it requires a subjective balancing of an artist’s right of expression against a person’s right of publicity. An Ohio case decided in 2000 involved Tiger Woods suing an artist for using his image in prints of a montage depicting Tiger playing at the Masters in different poses along with images of other great golfers. There, the artist argued that his prints were art and were not commercial, while Tiger argued that the prints were sports merchandise and were commercial. The Ohio court held that the original work and the limited edition prints were protected by the First Amendment because they were a montage that conveyed a message and were not merely posters created from a photograph. In a California case decided in 2001, the estate for the Three Stooges sued an artist who had created a charcoal drawing of the Three Stooges and sold the image as litho- graphs and on t-shirts. The California court held against the artist stating that the image was so lifelike that it was not “transformative” enough to enjoy the protection of the First Amendment. In other words, under California law, transformative images are immunized by the First Amendment, but images that were too lifelike were not. The California court went on to explain, that if a person’s image is just raw material for original artwork and the artistic expression is the dominant attribute of the artwork, then the artist’s First Amendment rights will trump the person’s right of publicity. The California court used Andy Warhol portraits as an example of a work where the artist’s rights would supersede the person’s right of publicity. This test, unfortunately, does not provide any de nite guidance because it requires a court to make an aesthetic judg- ment on a case by case basis and different courts can reach different results. In one 2003 California case applying this test, the court found that the musicians John and Edgar Winter (the Autumn Brothers) were recognizable in a comic book but that it was transformative because they were depicted as half human and half worm and was there- fore protected. However, a 2003 Missouri court found that the use of the name of a hockey player, Tony Twist, in a comic book was not transformative and was just a ploy to sell more comic books. Whether a caricature, or any artwork, is exempt from the right of publicity law, will depend on an aesthetic evaluation of whether it conveys a message, whether it is “transformative,” or whether it meets some other test that the state decides to apply (because remember, each state has its own law), and will require thorough review of the particular state’s law. Are single and original artworks exempt? Generally, yes. Many state’s (including Cali- fornia) include an exemption in their right of publicity statutes for single and original works of artwork. However, once copies of that single work are made as prints, even limited edition prints, on t-shirts, on posters, etc. then this exemption falters and the balancing of rights discussed above is required. For example, in the Three Stooges case, the California court noted that the original charcoal did not infringe on the rights of publicity, but the lithographs and t-shirts did. Are political figures fair game? No. In most states, the same restrictions apply to use of a politician’s image as to any other person. While news and political commentary are protected speech that generally trumps the right of publicity, commercial use of a politician’s image will raise a red ag. For example, Arnold Schwarzenegger and Rudy Giuliani have both gone after people for use of their image. Arnold targeted a bobble head doll while Rudy threatened to sue PETA for using his image in a mock Got Milk advertisement (“Got prostate cancer?” related to milk consumption allegedly being linked to prostate cancer). Are dead celebrities fair game? It depends. Some states have posthumous rights (such as California, Indiana, Oklahoma, Tennes- see, Florida, Kentucky, Illinois) while others do not (New York, where Marilyn Monroe was found to have resided). Even if a state has posthumous rights, states vary on how long those posthumous rights last. For instance, in Tennessee (where Elvis resided), posthumous rights last forever, while in California they last for 70 years and in Florida they last for 40 years. What do i do if i want to use a person’s image in a commercial way? If you create a work that you or another party plan to use in a commercial way (like in an advertisement, on products, or mass publication of your artwork), be sure that you have permission to use the likeness of anyone who appears in the work. If the artwork is created for another party, ask them to agree to defend and indemnify you if a dispute does arise. And don’t forget to get it all in writing! Meaghan Hemmings Kent is an intellectual property attorney in the Washington, D.C. of ce of Venable LLP. She advises clients on all areas of intellectual property law, including copyright, trademark, patent, trade secret, right of publicity, and domain name law. She can be reached at 202-344-4481 and mhkent@venable.com. The views expressed in this article are those of the author, do not constitute legal advice, and should not be attributed to Venable LLP or its clients. Winter Post-Con EF Available Now! The winter Post-Con issue of Exaggerated Features is out now! The print version is in mailboxes now, and the PDF is available to members here. 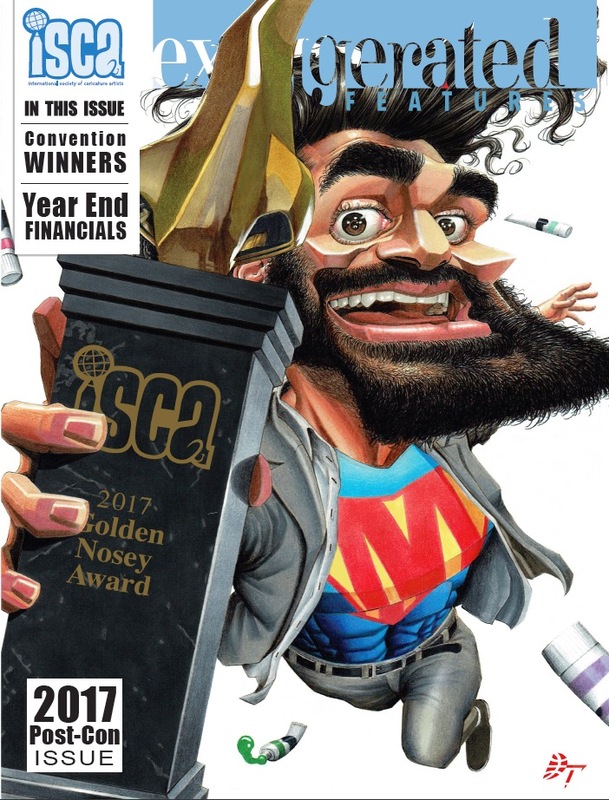 This issue features a round up of all of the winners from the 2017 ISCA convention in Orlando, as well as an interview with the newly-crowned Golden Nosey winner, Manny Avetisyan! Also in this issue: A gallery show of rock and roll caricatures in Cleveland (by Tom Faraci and Derek Brennan), a comic recounting the State Fair of Texas (by Lorin Bernsen and Robert Sundin), and an American caricaturist in Prague (by Sam KingDavis)! Cover art is by our 2016 Golden Nosey winner, Dai Tamura. Oh, also, we're on Facebook now. Exaggerated Features is included in your ISCA membership. Our next convention location is kind of a big deal. ISCA Con 26 is a Wrap! ISCA Con 26 is over! What a week! Congratulations to all of this year's winners, especially to Joe Bluhm, Lindsey Olivares, and Manny Avetisyan, who took home the Bronze, Silver, and Gold Noseys, respectively. Thank you to all of our speakers and sponsors, and a HUGE thanks to President Matt Zitman, who stepped down this year, handing the ISCA reigns to Chris Moore as we head into 2018. Chris will be joined by returning board members Cory Lally (Vice President), Tom Faraci (Treasurer), and the newly elected Secretary, AJ Jensen. Look for a full convention wrap up in the post-con issue of Exaggerated Features! Pre-Con EF Now available in digital format. This year's Pre-Con EF is now available in digital format. Inside you'll find convention rules and the schedule, as well as an interview with guest speaker Tom Fluharty and and wonderful tribute to this year's Hall of Fame inductee, Glenn Ferguson. New Digital Issue of Exaggerated Features Available Now! Here is the link to the newest issue of Exaggerated Features!! This one is only found online as it has several videos and links found throughout. Join us in welcoming David O'Keefe back to the ISCA stage!